Dominique Rodgers-Cromartie was selected 16th overall in the 2008 NFL Draft. Here are three things you need to know about each Super Bowl team, based on Monday’s media sessions. Mike Garafolo was with the Broncos, Peter Schrager with the Seahawks. 1. Early retirement plan? Dominique Rodgers-Cromartie has the early lead for the biggest surprise of Super Bowl week. 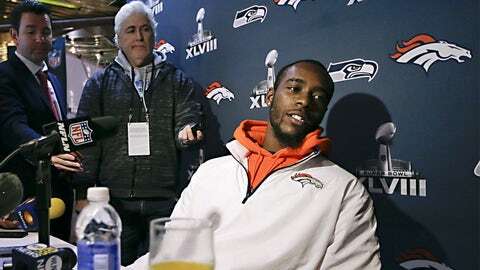 The 27-year-old cornerback told reporters Monday he’s pretty sure he’s going to retire if Denver wins the Super Bowl. That’s quite the statement, considering Rodgers-Cromartie is having a very good season and is headed toward unrestricted free agency. The former Philadelphia Eagles and Arizona Cardinals corner said he’d like to mentor children and perhaps stay involved in football in some way. But he doesn’t seem to have a burning desire to play much longer. "I gave myself five years, I’ve been playing six. Everything is cool," Rodgers-Cromartie said. "If I feel like at the end of the day that’s truly what I’m going to do, that’s what I’m going to do. … Coming from a small school, you know all the talk: ‘Small-school guys aren’t supposed to be in the NFL,’ and stuff like that. ‘You’ll only be in this league two or three years.’ So I gave myself five." 2. Quarantine (sort of) lifted: Kicker Matt Prater traveled with the team Sunday and has begun to shake off a virus that kept him out of practice all last week. In fact, coach John Fox sent Prater home so he wouldn’t infect other players. Fox joked Sunday that the team kept Prater in a "bubble." The strategy worked. As of Monday, the team had no other illnesses to report. The Broncos aren’t quite in the clear just yet, and the last thing they want is for Prater to spread germs in the days leading up to the game. So Prater should expect the kind of treatment he gets when he’s about to line up a game-winning kick, which is to say he’s about to be shunned for a few days. "It depends on how bad it is and what it is," cornerback Champ Bailey said with a laugh. "He’s part of our family, so it’s going to be hard not to be around him. But he knows he has to be careful and can’t spread anything around here." 3. One-on-one: The Seahawks usually play their cornerbacks right and left instead of moving them around to create matchups. Would that change now, in the biggest game of them all? The Broncos are betting it won’t. "I honestly have no idea, but our coaches told us 98 percent of (Richard) Sherman’s snaps have come on the (offensive) right side," wide receiver Demaryius Thomas told FOX Sports, "so I’m assuming that." Thomas and Sherman are both 6-foot-3, so it’ll be an interesting matchup of length, smarts and athletic ability when it happens. "He’s just so patient, he takes his time, he doesn’t try to do anything too fast. The best corners are patient," Thomas said, adding of his approach: "So you’ve got to be patient." 1. Plan in place: Pete Carroll’s never coached in a Super Bowl before, but he’s got quite a coaching blueprint to work from. Carroll said on Monday that he’s leaning on what he learned from Bill Walsh when they worked together in San Francisco in the mid-1990s. "Our plan is clear. We installed a gameplan last week. That’s the San Francisco style," said Carroll, a defensive coordinator for the 49ers under George Seifert while Walsh served as a consultant. Carroll said that the majority of the defensive gameplan for Sunday’s Super Bowl was installed last week, and that this week will be focused on fine-tuning, staying fresh, and preparing for everything the league’s top offense can throw at them. 2. Will Percy play? It’s a Monday. So cue the record up and play it again — time for a Percy Harvin update. Fellow wide receiver Golden Tate, seemingly not tired of being asked about Harvin’s health, said, “I think it’s huge. I really admire the way he plays the game. He’s had some tough breaks this year, but at the end of the day he’s had a positive attitude, staying positive. He’s ready to go. I’m excited to have him back on the field. He brings another whole dimension to this offense and to special teams. (He is) just another weapon on this offense, another playmaker (and) another guy who can break the game at any point." 3. Medicinal marijuana? With the topic looming in the news this week, Carroll couldn’t avoid the inevitable football and marijuana discussion. Carroll addressed a reporter’s query about whether marijuana could eventually be used to help treat concussions. "I would say that we have to explore and find ways to make our game a better game and take care of our players in whatever way possible," Carroll said. "Regardless of what other stigmas might be involved, we have to do this because the world of medicine is doing this." Earlier in the week, NFL commissioner Roger Goodell was asked about the issue. "We will follow medicine, and if they determine this could be a proper usage in any context, we will consider that," Goodell said. "Our medical experts are not saying that right now."